tyre designs for urban operations. But are they tough enough for a life in the waste and recycling sector? It’s easy to see why the tyres take such punishment on urban collection rounds. There is little room to spare as Chris Percival and his Volvo pass between two ancient buildings in the centre of Colchester. Refuse Collection Vehicles (RCVs) skip-trucks and truck-mounted vacuum sweepers operate in some of the toughest conditions of any commercial vehicle. But you don’t need me to tell you that. Tyres need to deliver a good mileage. But also provide traction in poor weather, the ability to withstand heavy loading and constant contact with kerbstones and ‘traffic calming’ measures in urban areas. They also need heightened resistance to puncture damage when visiting the MRF, so ‘damage’ is a more likely cause of tyre failure and downtime than ‘excessive mileage’. In short? less common (at least in many national markets), then there are increased dangers from ‘kerbing’ – crushing the sidewall alongside a raised kerb – thanks in part to a constant increase in parked cars in narrow residential streets, or heavy contact with ‘traffic calming’ obstructions on a regular basis. Into this mix of requirements, we also need to remember that the drivers of refuse collection vehicles, skip-trucks and truck-mounted street sweepers all have schedules to keep to. But unlike a regular haulage (line haul) truck, it will be far more expensive to hire-in a replacement, should there be unplanned downtime resulting from tyre failure. In fact, in many global markets, a replacement short-term hire vehicle just isn’t an option. Even a half day lost through tyre damage is going to be difficult to make up by the end of the week. The solution? Recognising that damage caused by contact with kerbs and other obstructions is now the major factor in potential truck tyre failure, Falken Tyre Europe has recently introduced two new designs of truck tyre aimed at the operator of ‘regional transport’ (in other words, applications where long-distance mileage is not the key factor in tyre choice) and ‘construction site’ use – which is about as close to waste and recycling applications as we’re likely to get. The two new ‘high load’ tyre models – the ‘RI 151’ and the ‘SI 011’ – have recently been introduced alongside the availability of new sizes for the already well-proven Falken ‘GI 388’ truck tyre range. The RI 151 has been designed primarily for local urban operations. It carries the ‘Three-Peak Mountain Snowflake’ (3PMS) side wall mark, denoting good all-weather capability. Initially, 295/80R22.5, 315/60R22.5 and 315/70R22.5 sizes will be available. These new tyres are suitable for axle loads of up to eight tonnes. Falken has also introduced a new ‘Winter Tyre’ for truck steering axles – the ‘SI 011’. The tyres feature a new ‘flat’ profile to give an enhanced contact, also promoting a more even wear pattern across the tyre. The new tread patterns have been developed using advanced ‘4D-nano design’ technology and have been designed to deliver the best possible combination of grip, mileage and lifespan. This technology allows for in-depth analysis of the changes in compound composition throughout the life of the tyre and helps engineers manipulate material properties at a nano level. “This technology really helps us increase the performance of our tyres,” explains Markus Bognor, managing director of Falken Tyre Europe GmbH. “By developing these new tyre models and sizes, we are responding to the growing demand for high-load tyres,” he confirms. “This will enable us to cater for operators’ individual needs more effectively, while helping our customers save money over the longer term,” he added. How confident is Markus Bognor that Falken has what it takes to win a larger share of the more specialised markets for truck tyres, such as in the waste and recycling sectors? The answer? Confident enough to arrange for a set of the new tyres to be supplied and fitted to a ‘real life’ refuse collection vehicle operated by a high-profile commercial waste contractor working in a tough, urban environment. 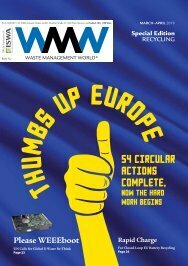 And then have the end-results reported in Waste Management World ‘Collection & Handling’. In other words? He’s pretty confident! But where to do the test? The historic town of Colchester, Essex, UK, features a Norman castle and many medieval buildings arranged within a patchwork of narrow streets and lanes, with tight turns, width restrictions and steep gradients. Get things wrong here with a large 26-tonne RCV and it could be very expensive. Tyre failure could cause traffic hold-ups in this busy commercial centre with its many corporate and insurance company offices and could easily undermine any operator’s hard-won reputation for service reliability. 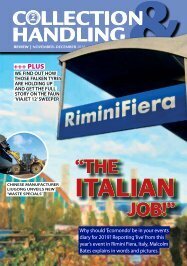 With a population of 105,000, the town of Colchester is then an ideal place to put these new Falken tyres to the test. Next? We need to find a commercial waste contractor with a reputation for “doing the job right”. For being sensitive to environmental concerns and having a reputation – even among rival waste contractors – for high standards of customer service. CSH Environmental is just the sort of operator we’re looking for. This family-owned waste and recycling contractor has forged a loyal customer base throughout the county of Essex, north of London, and operates some of the smartest, cleanest vehicles in the business. Why pick a regional waste contractor with a fleet of just thirty vehicles, instead of a large multi-national waste industry PLC, with hundreds? Hang on a minute, CSH Environmental is no small town operator of little consequence – company director Mark Slade is son of the company founder and also a director of The Visionscape Group, part of a consortium that is building – and will be operating – a 1.2 billion Euro contract designed to bring modern concepts of refuse collection, recycling and street cleansing to the city of Lagos in Nigeria. What Mark doesn’t know about the waste and recycling business, isn’t worth knowing. Talking of drivers, it’s time to meet Chris Percival and his Volvo FE 280 6x2 rear-steer refuse collection vehicle (RCV) fitted with VDK Incomol ‘Pusher 4000’ compaction body and multi-purpose trade binlifter. Mark tells me it’s been in service for over two years, but if I didn’t know that, I’d have guessed it was no more than four months old, it’s that free from dents and scrapes. It’s a clean machine. So how best to test a new range of strengthened side wall, high load, urban duty tyres from Falken that have been designed to help cut fleet management costs? Subject them to a real life operational trial with a company like CSH Environmental. After a call to Gary West, fleet manager at CSH Environmental to set things up, senior workshop fitter Dave Bishop arranged to have a new set of Falkens fitted to Chris Percival’s Volvo before I arrived on site. The mission? Chris and his Volvo operate exclusively within the historic town centre of Colchester, where, he tells me, he has some challenging locations to visit – including some retail units and hotels in the oldest part of the town and some modern corporate offices that are often very restricted as a result of cars being parked right where the waste and recycling containers are located. Today, he is on co-mingled recycling, so there is a lot of paper, cardboard and packaging materials to collect – all within the busy downtown area. “Since the Volvo was delivered, I’ve only clocked up 32,000 kilometres so far, and yet I must have had four ... no, five lots of tyres on the drive axle in that time. Most have been replaced as a result of premature failure due to kerb damage, so I’m keen to see how these new Falken tyres perform,” he adds, while negotiating his Volvo RCV between another badly parked car and a 400-year-old building with just centimetres to spare. common sources of premature failure in our business and while we can never eliminate downtime resulting from punctures on our skip-trucks on rough sites, it would make a major difference to our operating costs if we could extend the life of the tyres on our f leet of refuse collection vehicles by reducing incidents of premature failure,” Dave Bishop suggests. The bottom line? ‘Collection & Handling’ will be back in the town of Colchester in a few months to see how the Falkens are doing in a constant battle with the kerbs of Colchester!